If there is one industry theme or trend that has emerged in the past half decade or so it’s that specialty printing is gradually becoming the mainstream, as commercial printers have been adding (and are continuing to add) capabilities that allow them to pursue opportunities beyond what we normally think of as “printing.” Now, make no mistake: no one is going to confuse PRINT with a wide-format show. It is still predominantly an event for mainstream commercial printing—however we want to define “mainstream.” But wide-format and specialty graphics are playing a larger role at PRINT as these technologies, bit by little bit, continue to migrate into the mainstream. 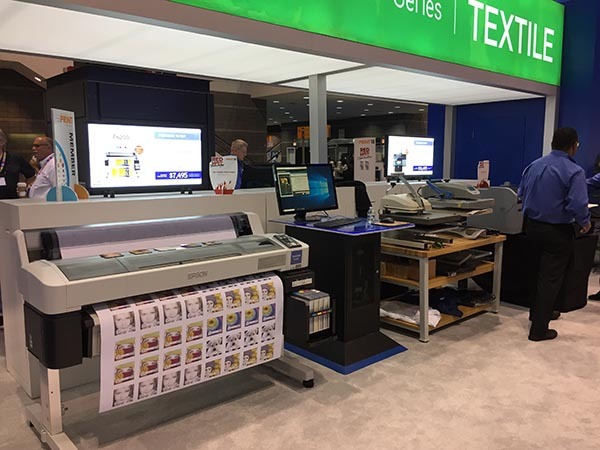 As a result, PRINT has not traditionally been a top venue for wide-format or specialty printing equipment announcements per se, but exhibitors that do bring their wide-format gear have increasingly found attendee interest in it. Textile printing equipment also gets a fair amount of attention, which doesn’t seem like it would be the case, but adding some kind of direct-to-garment or dye-sublimation printing can open new opportunities for commercial printers to offer complementary and supplementary products to what they typically produce. An added benefit is that these kinds of printed items are high-value print applications that can command a premium, as I may have mentioned in this space on more than one occasion. That said, Konica Minolta took PRINT 18 as an opportunity to debut its Accurio Wide 160, a 1m UV-LED hybrid rollfed/flatbed printer. In this day and age, it might seem counterintuitive to launch a new wide-format line given the vast and well-entrenched competition, but in some sense their absence in that space is a bit conspicuous, especially as KM printheads are used in many other vendors’ units. Plus, as KM increases marketshare elsewhere, having a wide-format box makes sense, and gives KM customers an entry into the wide-format space to pursue those aforementioned high-value print products. As for the deets, as the kids say: the Accurio Wide 160 can print six-color or four-color-plus-white. Although it officially ships later this month, Konica Minolta has already sold a couple of units on the show floor. Later this month at the SGIA Expo, Konica Minolta will also be introducing its big brother, the 2m Accurio Wide 200, which offers a slightly wider color gamut than the 160. Epson spent last summer revamping its T Series of technical printers, targeted toward the AEC (architecture, engineering, and construction) markets—end users, specifically—launching its SureColor T3270, T5270, T7270, T5270D, and T7270D. The AEC market has changed from the days when “reprographics” shops specialized in blueprints and other technical printing applications. Output has largely shifted to end users—architectural, design, and construction firms, whose hardware demands are more along the lines of WiFi connectivity and the ability to print from an iPhone or iPad than the more traditional hardware specifications like speed or quality. Epson is also demonstrating its textile printers, both direct-to-garment (the SureColor F-2100 Series printer which launched last spring and can print directly on T-shirts and other kinds of fabric-based items) and dye-sublimation (SureColor F Series), which can not only print on textiles but also on 3D objects such as coffee mugs, smartphone cases, and so on, using transfer-based dye-sub. These kinds of items are fairly inexpensive to produce and are, again, among those high-value applications that can be sold at a premium, at least for now. Canon is showing the latest entry in its technical printing portfolio, the imagePROGRAF TM Series, targeted for CAD drawings and GIS maps, as well as posters, signage, and banners. Also in Canon’s booth is the Océ Colorado 1640 64-inch UVgel-based roll-to-roll device, which launched last year. 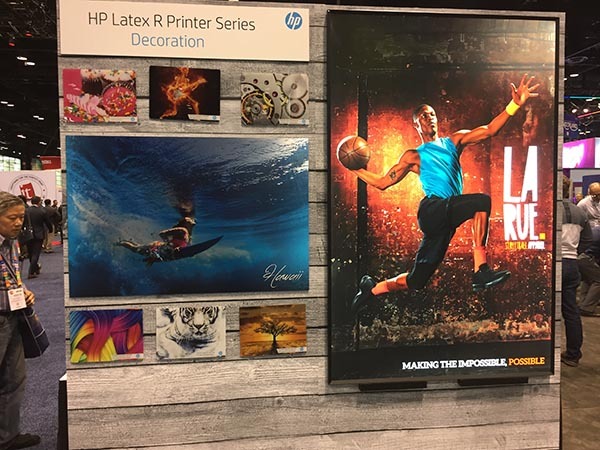 HP is showing its Latex R series, which was announced last spring, and added rigid substrates to the ever-growing Latex portfolio. Mimaki is continuing to stake its claim in textile printing, both transfer-based and direct-to-fabric, as well as with different kinds of dye-based inks to print on as broad a variety of natural and synthetic fabrics as possible. The company is also demonstrating its UCJV Series of UV cut-and-print devices. Mutoh is highlighting its recent forays into flatbed printing, the PerformanceJet 2508UF 100-inch UV-LED flatbed and ValueJet 1627MH 64-inch hybrid unit. Ricoh is concentrating on commercial print and its new software offerings, but is highlighting is recent alliance with EFI with the EFI Pro 16h UV-LED printer. Elsewhere, Ricoh’s Anajet division is showcasing its line RICOH Ri 100, 3000 and 6000 direct-to-garment (i.e., T-shirts) printers. 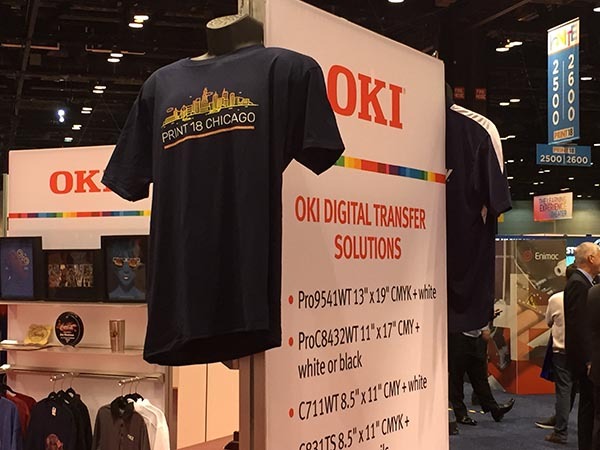 OKI is showing its transfer-based printers for T-shirts and other apparel. These units are toner-based, and offer a white toner option for decorating dark fabrics. 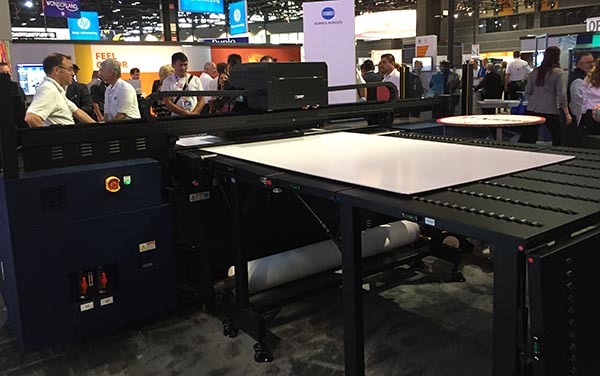 Later this month, the SGIA Expo in Las Vegas will no doubt bring a wealth of wide-format-specific product announcements. But for commercial printers who are still seeking new profit centers and business opportunities, PRINT 18 offers advice on how to get started.